I'm sure that I ate enough food last week in Charleston to gain 10 pounds and I'm perfectly alright with that. As much as I like the staples of norther cuisine, I absolutely adore good old southern food. Grits, greens cooked with pork and brown sugar, fried green tomatoes, biscuits, fried chicken, pulled port, etc. I'm fairly certain that it is beneficial to my arteries that I don't have access to these delights every day. 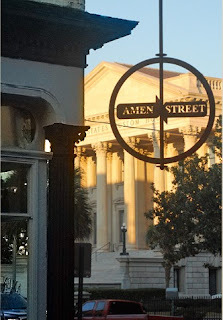 Monday night we ate at Amen Street Fish and Raw Bar down on East Bay steps away from the water. It was the first place we could get a table at a decent hour and we were all pretty crabby from traveling. It was delicious - even for those of use who do not enjoy creatures of the sea. Being overtired I forgot to take pictures of our meals. I had glorious Friend Green Tomatoes to start with and Steak and Grits as a main. Devine! My parents both had a daily special, a Red Shrimp Curry with Coconut Rice. 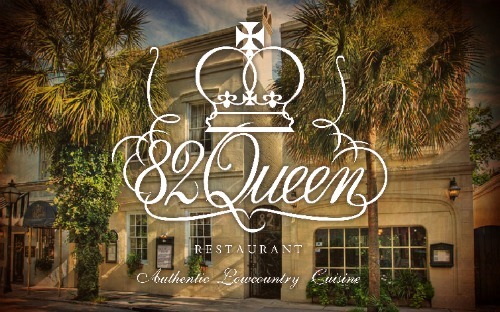 We stumbled upon 82 Queen while walking around on Tuesday morning. My mother, the garden obsessed, read that they had courtyard dining and went in to inquire. 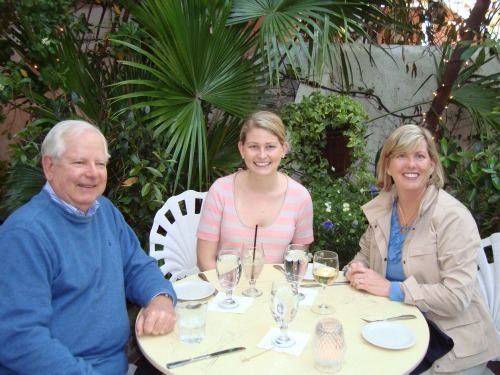 She came out beaming and insisted that we make reservations for an early dinner before our evening home tour. 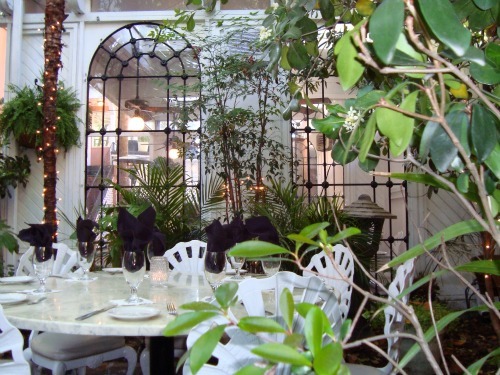 Here's a small portion of the courtyard as seen from our table. Those aren't mirrors but windows that lead into a semi-private outdoor room! 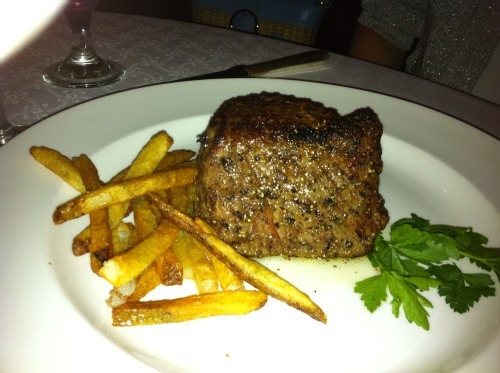 We all agreed that this was an absolutely Five Star meal, no wonder this is voted one of the best restaurants in Charleston! They had these cheddar herb biscuits that melted right in your mouth - full stick of butter in each biscuit! 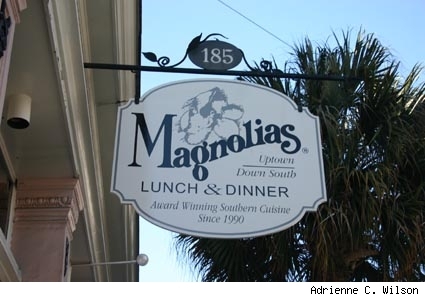 We all had traditional low-country cuisine including Fried Green Tomatoes, She Crab Soup, Shrimp and Grits, etc. My dinner even came with portabella fries - breaded, fried "sticks"of portabella mushrooms - they were delicious and not a way I would have considered eating mushrooms. Wednesday I got to choose the restaurant. 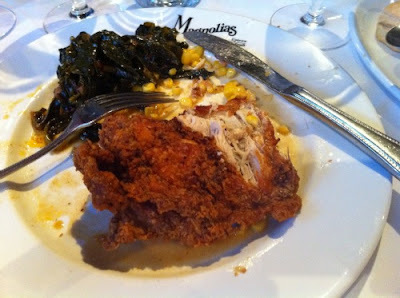 Magnolias on East Bay was it after seeing the Buttermilk Fried Chicken with all the fixings entree on the menu! This was definitely another Five Star meal - we all had amazing meals and ate way, way too much. Afterwards we had to walk off some of it along the battery before returning to our hotel to go into food comas. I managed to remember to take a picture of my dinner, after I had begun eating it...not pictured are the giant bowl of grits (yum!) and biscuits and gravy that came with the fried chicken, collards and corn. I ate every bite! You'd think that after all this food we wouldn't have wanted anything heavy on Thursday, but you're wrong. My family are eaters. 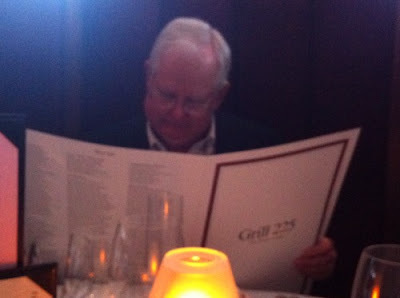 My dad wanted to eat a Grill 225, a classic steak house within the Market Pavilion Hotel. He and my mom had eaten there the last time they were in Charleston. 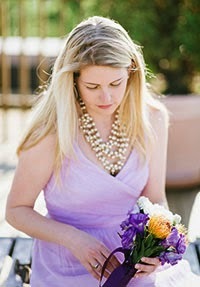 We sat in on of the circular banquets with high backs which make a private dining experience. There you have it, the reason I'll be crunching on salads and raw veggies for the next month or so to detox from all the deliciousness.